As noted in earlier posts, there were some odd things that I found in my initial research of my cousin Isadore (sometimes Isidore) Goldsmith, the sixth child and third son of Levi and Henrietta Goldsmith. For one thing, in 1896 he married the same woman, Mary Wheeler, twice, first in New Jersey and then a month later in Washington, DC. He never seemed to have a job. And then in 1907, he died just six months after his wife Mary died. She died from a stroke on April 17, 1907, when she was 54; Isadore died on October 11, 1907, from a cerebral hemorrhage. He was only 43. 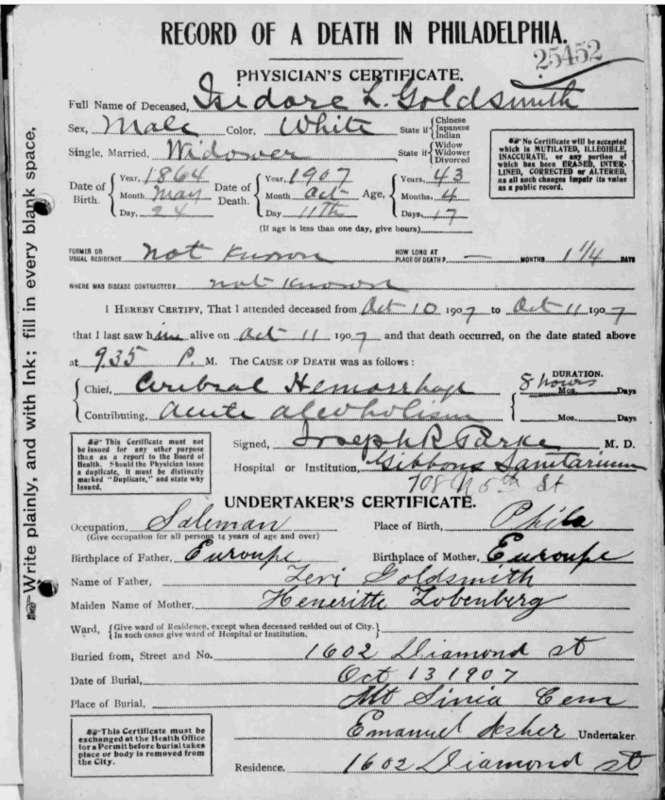 His death certificate revealed that he had died in a sanitarium to which he had been admitted the day before; it also noted that he was afflicted with acute alcoholism. I decided to do a newspaper search to see if I could learn more about Isadore. Unfortunately, that newspaper search and the searches to which those newspaper articles then led tell the story of a man whose life must have been very painful and sad. But first, some background on Isadore’s earlier life and what I found before I started the newspaper search. Levi died at the end of 1886. In the 1887 directory, George and Isadore are both listed again, still living at 1311 North Broad, and Isadore, who now would be 23, is still listed without an occupation, whereas George is once again working as a druggist. I thought this was a little strange—why didn’t Isadore have a job? But I thought perhaps he was in school and thought nothing more of it. In 1889 Isadore is not listed at all in the Philadelphia directory, but George is as well as their younger brother Sylvester. They were now living at 1709 North 15th Street where their mother is listed as well. George was a druggist, and Sylvester was a clerk.4 But where was Isadore? He does not appear in any Philadelphia directory after 1887 until 1898, nor does he appear in any other directory included in the Ancestry database. I found Isadore on the 1900 census, as I reported here. He was now married to Mary Wheeler, the woman he married twice, first on October 17, 1896 in Camden, New Jersey, and then on November 18 in Washington, DC. And as noted in my earlier post, on the 1900 census, Isadore and Mary were living as boarders in Philadelphia, and for his occupation, Isadore wrote that he was living on his income. There is an Isidor Goldsmith listed in the 1905 Philadelphia directory working as a grocer, and that could be Isadore—which would make the first time he is listed anywhere with an occupation. 5 The last record I had for Isadore was his death certificate, as noted above. That was all I knew about Isadore’s life until I typed his name into the newspapers.com and genealogybank.com websites and turned up a long list of articles detailing Isadore’s struggles. The Philadelphia Inquirer, May 24, 1891, p. 1. I had not found any marriage record for Isadore prior to his two weddings to Mary in 1896, but I noticed that in this legal notice he is listed with an alias—Isadore Garrison. I went back to search for listings or records under that name, and I found a record for the marriage of Isedore Garrison to Gean Morris on September 26, 1887, in Camden, New Jersey.6 Obviously, this marriage did not last very long since Isadore and Jean were divorced by May 24, 1891. 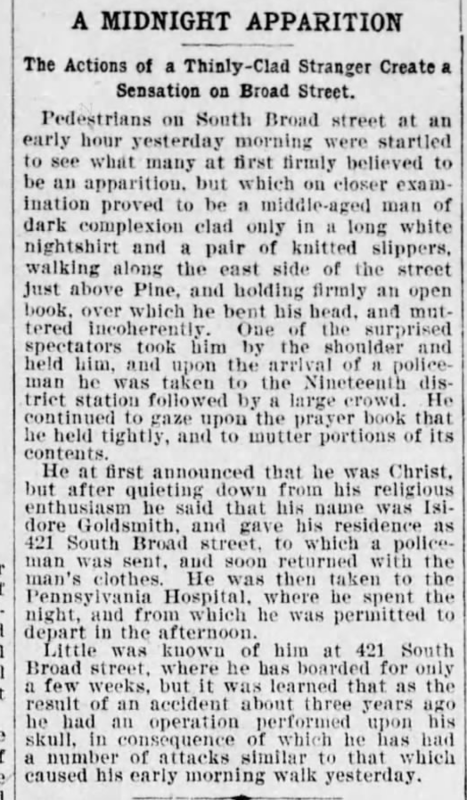 “Goldsmith Had Swallowed Laudanum, But It Was Quickly Removed,” The Philadelphia Inquirer, September 2, 1893, page 1. 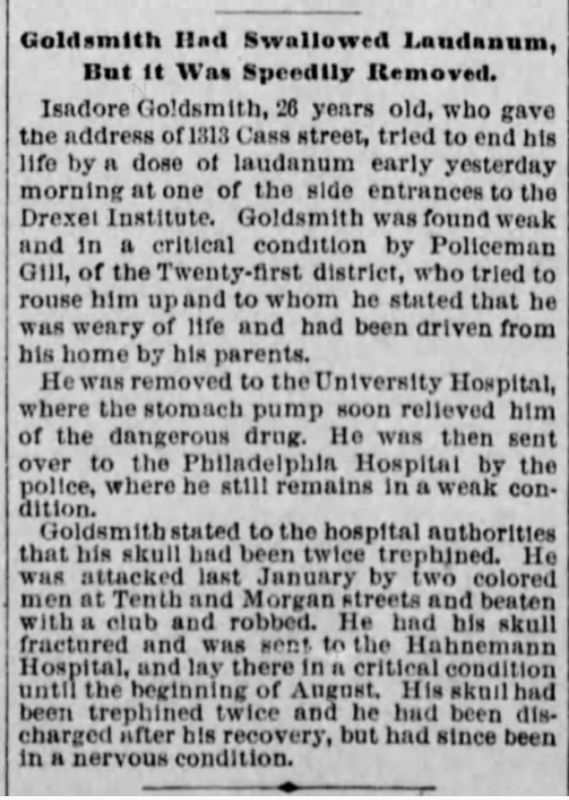 Isadore Goldsmith, 26 years old, who gave the address of 1313 Cass street, tried to end his life by a dose of laudanum early yesterday morning at one of the side entrances to the Drexel Institute. Goldsmith was found weak and in a critical condition by Policeman Gill, of the Twenty-first district, who tried to rouse him up and to whom he stated that he was weary of life and had been driven from his home by his parents. He was removed to the University Hospital, where the stomach pump soon relieved him of the dangerous drug. He was the sent over to the Philadelphia Hospital by the police, where he still remains in a weak condition. Goldsmith stated to the hospital authorities that his skull had been twice trephined. He was attacked last January by two colored men at Tenth and Morgan streets and beaten with a club and robbed. He had his skull fractured and was sent to the Hahnemann Hospital, and lay there in a critical condition until the beginning of August. His skull had been trephined twice and he had been discharged after his recovery, but had since been in a nervous condition. Trepanning, also known as trepanation, trephination, trephining or making a burr hole … is a surgical intervention in which a hole is drilled or scraped into the human skull, exposing the dura mater to treat health problems related to intracranial diseases or release pressured blood buildup from an injury. I searched for an earlier newspaper article that had reported this assault on Isadore, but could not find any article describing such an attack. And believe me, the Philadelphia newspapers had many, many articles about other victims who suffered fractured skulls in various ways, but nothing about this attack on Isadore. Had it actually happened? Mr. Goldsmith is now in the St. Clement’s Hospital for Epileptics…under the care of his family. He is one of seven children of a formerly great clothing merchant and manufacturer…. One brother is a druggist…His father was a great friend and admirer of ex-Mayor Stokley. “On the 26th of January, at 8 o’clock in the evening I was waylaid at Eleventh and Morgan streets and my watch and $15 in bills stolen. 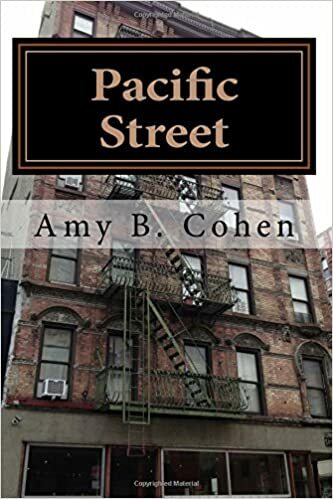 It was a cold, snowy night and few people were on the streets….I was jostled by two men…, and one seized my hands and the other robbed me, and, as they left, I received a blow on the back of the head. I was taken to the station house at Tenth and Buttonwood and then to the Hahnemann Hospital. There they made an exploratory incision in my skull, but failed to find any fracture. Isadore then described what happened the morning of September 8; he woke up having one of his “spells” and decided to go to Episcopal Hospital for help. Along the way he had a seizure. Some passersby helped him and took him to the saloon for some seltzer water. He also asked someone to get the police to assist him, but instead the police officer hit him with his mace on the sole of his foot. Others in the bar told the officer that Isadore was not drunk, but sick. Nevertheless, the police officer took Isadore back to the station house, where the magistrate did not let him speak and threw him in jail. Isadore was soon released, however. The bartender corroborated Isadore’s statement that he had not been drinking, and the doctor at the hospital where Isadore was taken after he was released from jail confirmed that he had epilepsy and that he had scars on his head from trephining, but he also said he smelled alcohol on Isadore’s breath. The reporter, however, thought that Isadore’s medicine, tincture of cinchona, smelled like liquor. Isadore’s roommate also stated that he had never known Isadore to be drunk. It was clearly the reporter’s conclusion that Isadore had been mistreated by the police and the magistrate. But Isadore’s troubles were far from over. On August 14, 1894, he was found unconscious on the street and taken to the hospital. Obviously, Isadore had severe problems, whatever their origin and causes. But why did he marry the same woman twice? More on that in my next post. What a sad story, Amy. I’m glad you were able to pick up his trace in the newspapers. This by far this has to be the most interesting and haunting accounts I have ever read. What a sad story about Isidore Goldsmith. So thoroughly newspaper documented too….anxiously awaiting the next post. Poor Isadore Goldsmith! The story of his life is truly a tragic one. I wonder about the causes of all his problems. He did not have a job of any significance, because his mental conditions did not allow him to work. Perhaps he suffered from a mental disorder, which could not be cured at the turn of the 20th century. Very impressive detective work as always, Amy! I do think he suffered from mental illness–whether it predated that assault or not is hard to say. Thank you, Peter. Poor guy. Looking forward to reading the next instalment Amy. Thanks, Alex—coming after the weekend. Hope all is well. I wonder whether he was having problems even before the attack. But I have no evidence of that. Thanks, Lana! It is—and likely a story of the lives of far too many people, even today. Thanks, Su. Sounds like he had major head trauma and the effects were long lasting. Probably was unable to work or even hold a minor job. That is really sad. Yes, it truly is. But I wonder whether he had mental health issues even before the assault since he had no job for years even before that, unlike his brothers. It’s hard to know whether or not his troubles began with the assault. My gut tells me he had mental health issues even before that, but I can’t be sure. I believe Isadore over the policeman. The poor guy really had a rough go of it. Could you imagine any kind of cranial surgery in that era? Yikes! But I’m very curious about his marriage under the Garrison pseudonym. What was his motive? I have no idea why he used a pseudonym. That and his lack of occupation makes me think his problems started long before the alleged assault. I think there is more here than I could find. I’m glad you found a medical reason for his behavior, as it, all too often, can be assumed as one thing and not necessarily in the victim’s favor. I also wondered about mental health. It’s hard to know how much was from the assault and how much was from prior problems. Thanks, Karen. Wow, what a story. It always amazes me the stories covered in the newspapers back then. I guess it was the Facebook or Instagram of the time. I’m interested to hear why they were married twice! That’s always my reaction, especially when I see those little news items about who’s visiting who and who’s traveling to where and long wedding descriptions—the news feed of its day! That’s one of the most disturbing stories you’ve shared here. Makes me shiver.